You are here: Home / Natural Fine Planetary Talismans / Ravishing Jupiter energies with Flawless Golden Yellow Topaz the superior alternative to Yellow Sapphire! And yes, citrine is not Yellow Topaz! Ravishing Jupiter energies with Flawless Golden Yellow Topaz the superior alternative to Yellow Sapphire! And yes, citrine is not Yellow Topaz! Comments Gorgeous Eye clean and one of the finest specimens of natural energy. Gorgeous Yellow Sapphire fashioned into an attractive octagon cushion. Not a single inclusion and most importantly this gemstone is unheated and fully natural. 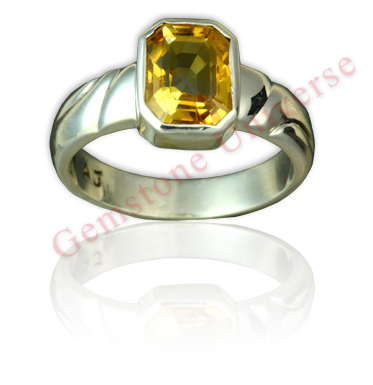 Golden Topaz and heliodors give best results as Yellow Sapphire alternatives and not citrine. In the Indian subcontinent citrine is sold under the false name of Golden Topaz and as a substitute for Yellow Sapphire. Nothing can be more farther from the truth. This gemstone which is also known as Sunhela/ Sunhela in the local language gives very poor results when it is used as a substitute for Yellow Sapphire. Most commercially available citrine is artificially heated Amethyst or treated quartz. This gemstone should best be avoided as a Yellow Sapphire substitute. Yellow Heliodor gives far better results for planet Jupiter. Is this ring still available? If so, is the ring open ie does the stone touch the skin? If not, would you have other natural unheated yellow topaz jewelry? pendant ?